As a disabled person I have always appreciated CounterPulse’s support and presentation of disabled artists. In the two plus years I have been with CounterPulse, I have seen several amazing shows by disabled artists: dancers on crutches, dancers with prosthetic limbs, dancers in wheelchairs, and dancers with a visual impairment. Being disabled, and an arts administrator, I was intrigued when Jess Curtis offered to involve CounterPulse as a test site for his company’s nascent audio description service. It was a rare opportunity to experience and learn about this practice first hand. For the last year or so, Jess Curtis, (dancer, choreographer, teacher, and one of the co-founders of CounterPulse) has been incorporating audio description in his own projects in Europe and San Francisco with his company, Jess Curtis/Gravity. For the first time, on March 3, 2018, Jess brought Audio Description to CounterPulse to beta-test the possibility of giving people with a visual impairment access to another company’s work. The test performance was Swivel:Hinge:Return by San Francisco dance group Wax Poet(s). Jess Curtis collaborates with Tiffany Taylor, a Bay Area-based dancer, performer, access consultant who is visually impaired. J Tiffany consults for organizations to ensure websites, apps and PR/Marketing content are accessible and user friendly for visually impaired people. Tiffany joined Jess as a beta-tester for Jess’ Audio Description and to present a pre-show Touch Tour demonstration for the Wax Poet(s). If you are unfamiliar with or new to audio description (as I was) it is a developing practice that uses wireless audio technology to support—in this situation—visually impaired audience member by providing a live description of a performance. The intended outcome of the Audio Description is to fill in meaningful details of a performance that are normally only accessible through an audience’s visual experience, providing access to a richer, more meaningful experience for visually impaired audience members. Participants with a visual impairment are given a small receiver with a single earpiece that fits comfortably over one ear. The narrator sits at the back of the theater describing the performance which is being transmitted to the headsets worn by participants. Wearing a stenographer’s mask to muffle the sound, the audio describer is able to describe the dance without disturbing other audience members. There is another component of audio description called a touch tour. The Touch Tour draws upon participants haptic (felt) experience as seen through the lens of performance theory. (Think of the haptics settings on your mobile device. When you touch a key on the keyboard, you feel a small vibration, that helps to orient you to the mobile device and use the keyboard more effectively). The Touch Tour allows persons with a visual impairment to familiarize themselves with the spatial qualities of the stage, the physical attributes of the performers, their costumes and some of the movements from the performance. With an understanding of the dance, Jess takes visually impaired audience members for a pre-show meet and greet with the dancers. The dancers each introduce and describe visual details of themselves, and what they are wearing. For example: “My name is Heather and I am a full bodied woman about 5’3”, long dirty blond hair, and I wear a white one piece type coverall garment”. Patrons with visual impairments are then escorted through the stage space by the narrator, getting a felt sense of its size and proportions. Many visually impaired audience members have some sight, referred to as “low-vision,” and can navigate the performance space easily enough by themselves under the brighter work lights of the pre-show stage. Some have mobility aids like canes or guide dogs, and some may appreciate taking the elbow of a companion or guide to walk thru the space. In the more brightly lit pre-show space they are able to inspect elements of the set or musical instruments up-close, touching, hearing or seeing any objects that will be used by actors and dancers later and learning the basic stage geography. After getting a sense of the stage, the dancers may demonstrate, describe or name certain arm or leg gestures, complex movements, positions or partnering events, often even allowing persons with a visual impairment patrons to feel the dancer’s bodies and feel the movements building a haptic vocabulary that Jess can refer to quickly later. Establishing some common vocabulary is crucial to the success of the audio description so that when Jess says during the narration, “Heather spins center stage and does the ‘heart-shaped’ arm gestures she demonstrated for us earlier” persons with a visual impairment can refer back to their memory of those gestures and understand. You may be asking yourself: Why would a blind person go to dance concert or a visual art exhibition? At least, this is the question I had. As Tiffany explained, many persons with a visual impairment do have some vision, enough to see indistinct shapes or colors or a sense of light and dark. The touch tour along with the audio description provide support information so that persons with a visual impairment have a much better outcome in their experience of the performance. Furthermore, many people with visual impairments lose their sight later in life and have previous memories of sight. 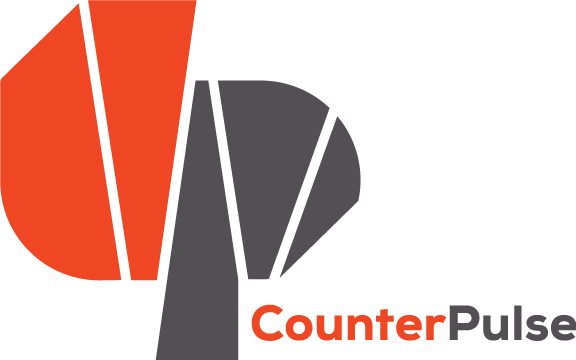 When CounterPulse talks about providing resources to build community you only have to look at CounterPulse adopting audio description, providing ASL interpreters, and going beyond ADA accessibility requirements to see the truth behind CounterPulse’s claim. For myself I found Audio Description educational in general. As a sighted person my exposure to Audio Description was a moment for reflection on the challenges being met by our brothers sisters, dads, moms, friends, and strangers with a visual impairment every second of everyday. If you are interested in talking to Jess Curtis/Gravity about utilizing their new Access Services Program feel free to contact Jess or Tiffany at info@jesscurtisgravity.org. Again, a big thank you to Jess Curtis, Tiffany Taylor and Wax Poet(s).